This beautiful Round Shared Prong Mothers Ring can be customized to fit your desires. This Stunning Mothers ring, mom ring, nana ring, can be customized for you with your choice of Sterling Silver, 10k white gold. 10k yellow gold, 10k rose gold, 14k white gold, 14K Yellow Gold, or 14K Rose Gold. Each birthstone measures 3.5mm. You can further personalize this lovely ring by selecting the number and type of birthstones, the ring size, and choosing between natural and imitation gemstones. 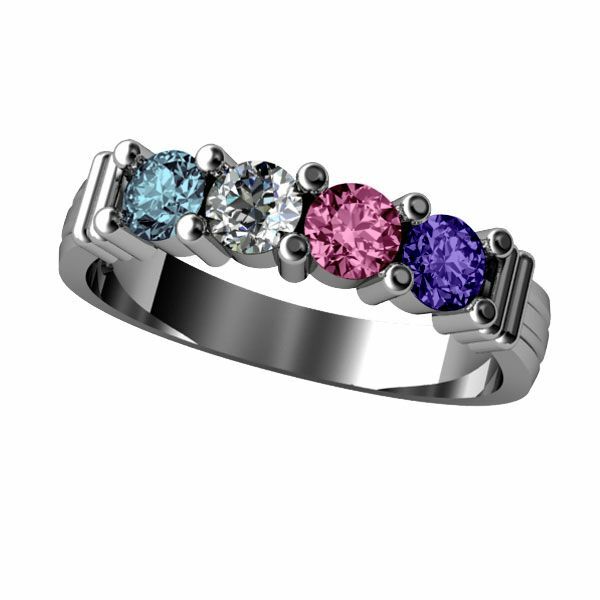 Gift her This Ultimate Shared Prong Mother Birthstone Ring, Mom Birthstone Ring, Mom Ring, Nana Ring, to show her that she is special and loved! A perfect gift for the special lady in your life! Mother's Day Rings, Mother's Rings, Christmas, Anniversary, Birthday, it just makes a great gift for mom! Recently I purchased a Mother's Ring from Central Diamond Ctr. I have never written a review, but am making the effort because of the quality of workmanship and the superb customer service I received here. I experienced that this company really does work very hard to resolve all issues (my issue had nothing to do with the quality of the ring, but rather, that the style I had chosen was very uncomfortable on my finger). They not only resolved the issue, but did so in a gracious, painless manner. I found their customer service rep. very easy to work with and very eager to be a part of the solution for my specific situation. I would recommend them to friends and would definitely buy from them again in the future. Extremely pleased! My wife loved the ring and the seller was very fast in responding and shipping the ring. Beautiful ring - beautiful gems with vibrant color saturation! superb seller! excellent communication! very friendly and helpful! thank you so much! This Mothers Ring is Beautiful I got the 5 stones it was made the way I wanted I love my Ring I have always wanted a Mothers Ring I found this one I couldn't pass the great price, I am one Happy Customer, I got my Ring a lot earlier than expected. The ring arrived much sooner than I had hoped for! It is beautiful: much bigger and better than I had expected. I am very pleased and wish to re-order from this seller as soon as I find another reason. Thank you.